"I have had my iPhone for two years. Believe it or not, I have never deleted any text messages. Obviously I get into trouble – My iPhone is just being slow because I have so much messages. Is there an easy and fast way to transfer all my iPhone SMS to my computer? Any way, I still do not want to delete any of them." Nowadays, even though there are so many free instant messaging softwares to communicate with others, most of people still prefer to send those important information via SMS in case of privacy leak or missing the text messages. And those important text messages usually are stored on iPhone memory, which is taking more and more storage space on the iOS device and also it is not safe as well due to risk of corruption and loss of the text messages. So one of the best solution is to transfer those important text messages from iPhone to computer, thus you can not only save the iPhone storage but also ensure safety of the iPhone messages. So this article will show you the effective ways to export iPhone SMS to computer, either Windows PC or Mac. Note: Before going too far, if your iPhone messages has synced and stored in iTunes, you can extract iPhone messages from iTunes Library and save onto your computer. In order to safely transfer text messages from iPhone to computer, it is strongly recommended to rely on a professional third-party iPhone SMS Transfer program - Coolmuster iOS Assistant (Windows/Mac) for iPhone/iPad/iPod, which allows you to securely and selectively back up iPhone text messages to computer without any risk of information leakage and also it supports to export messages in different formats, like HTML, Text, CSV and DB. What Can the iPhone SMS Transfer Do for You? 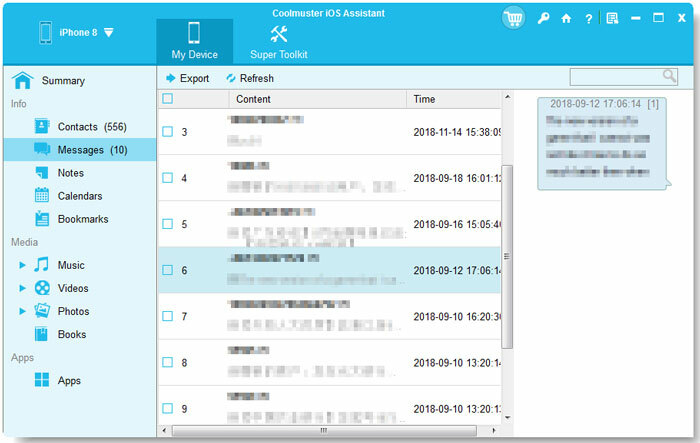 Besides, this Coolmuster iOS Assistant can better manage your iPhone data and iPhone memory and allows you to selectively transfer all kinds of iPhone files to computer, including contacts, text messages, call history, notes, Safari bookmarks, calendars, photos, videos in Camera Roll and etc. with ease. Before syncing iPhone messages to computer, you can freely preview the text messages in details, including message contents, forwarding and received date & time and etc. What's more, you can also edit/add/import/export/delete the other iPhone data directly on computer, such as contacts, bookmarks and many more. And this program is fully compatible with almost of iOS devices, including iPhone Xs Max/Xs/X R/X/8 Plus/8/7 Plus/7/6s Plus/6s/6 Plus/6/5S/SE, iPad Pro, the new iPad, iPad Air, iPad 2, iPad mini, iPod touch/Shuffle/Nano/Classic and etc. And the program can So you don't need to worry about the compatibility of the iPhone SMS Transfer. And also this program can ensure you it is 100% green, virus-free, ad-free without storing your personal information on the server, like many others say, you can rely on it to manage your iDevice. Now, please download the iPhone SMS transfer in Windows or Mac version as below, and follow the guide (based on Windows platform) below to export SMS from iPhone to computer easily. Make sure you have already connected your iPhone to computer with USB cable. Launch the installed software and it will automatically detect your iPhone. Note: Please ensure that you have installed the latest iTunes on your Windows PC, or the software might fail to detect the connected device. When the the software has detected your iPhone successfully, the software will display all iPhone files, including the contacts, calendars, bookmarks and etc,. Find the "Messages" category, preview all the text messages in your iPhone, then you might select the text messages you want to transfer by ticking them out. After selection, you might hit the "Export" button to copy the selected text messages from your iPhone to computer immediately. Now, all the selected SMS messages on your iPhone are saved in your computer. You can view all the text messages on your iPhone and on your computer anytime you like. Just free up your iPhone memory and make room for new data. Note: For better understanding, you can watch the video tutorial on how to copy text messages from iPhone to computer as below. iExplorer is another third-party tool to help you transfer SMS from iPhone to computer. However, if you want to access SMS and contacts, this program only works for iPhone devices that has been jailbroken and also this program is not secure than the previously recommended Coolmuster iOS Assistant due to information safety. Also, one thing you need to know is that it may take much time to load the files and transfer messages from iPhone to the computer, especially when your network condition is not stable. Anyway, you can refer to the instructions as below to perform this program to transfer SMS from iPhone to computer. Step 1. Get your iPhone connected to the computer and open the iExplorer. Step 2. Enter the Data tab in the Device Overview screen and then select the Messages button. Step 3. Then you will see an interface where you are asked to make an iTunes backup or not, choose the Yes option. But if you already have an iTunes backup, iExplorer will ask whether to Use Last Backup or Refresh to create a new one. Decide it as you needed and wanted. Step 4. Now, iExplorer will load your messages and display them on the main interface. You can now select a conversation in the left panel to preview more. Here, if you don't want to transfer entire conversation, you can select some message bubbles as wanted and click "Export" to transfer the wanted messages from iPhone to the computer as needed.